Police investigating online officer impersonator. 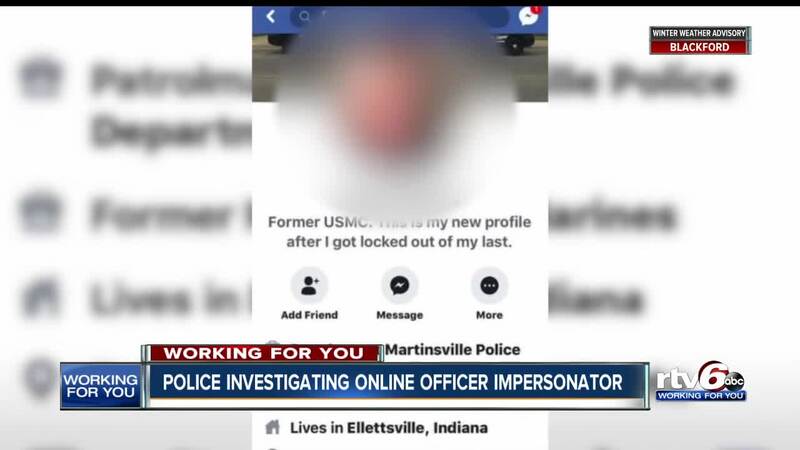 MARTINSVILLE — Over the weekend, Martinsville Police were alerted to someone on Facebook posing as one of them. "None of us know him," Interim Martinsville Police Chief, Rodger Wiltermood, said. "He is currently not a member of the Martinsville Police Department. Nor is he a former member of the Martinsville Police Department." The fake profile has since been deleted. "In the background is City Hall. Along with two Martinsville Police Department vehicles with his photo," Chief Wiltermood said. RTV6 is blurring the profile picture (above) after a man came forward saying he's the person in it. Someone stole his photo to create the profile. It's still unclear whether the impostor was using a real name. "That betrays the trust of the citizens of not only the city of Martinsville, but the state of Indiana," Chief Wiltermood said. Martinsville police say the call came from the Monroe County Sheriff's Department. A complaint about someone posting in a Bloomington Facebook group, offering people rides. "Out of the goodness of his heart, he was just going to assist people that had trouble with the flood and actually offer them rides in his vehicle, his personal car," a Bloomington resident, Julie Wall, said. Wall happened to see the impostor's posts. "I saw the red flags and I knew something wasn't right," she said. Things took a turn when, according to Wall, she received three friend requests from the stranger. "I denied them and each time I denied them he sent me another one again. So that was pretty creepy," Wall said. "They should be in their uniform. They should be in a full fully dressed uniform with a badge," Martinsville Police Chief said. If you're stopped by an officer and they're not in uniform, they should be in a marked patrol car - letting you know they're legit. If you're ever unsure about a person's identity, call dispatch to verify. Wall says she wants investigators to find out who's behind the fake police profile. "I hope he becomes exposed because I'm kind of worried about our community and our elder people," Wall said. Remember, if a stranger online sends you a friends request, or offers some form of help and you feel skeptical about it - trust your gut.